Th-INK-ing of You: For the Love of Wood Anniversary Hop! 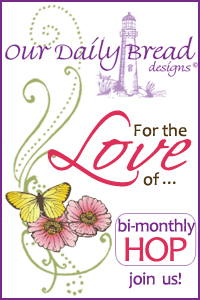 Welcome to Our Daily Bread Design's Alumni Team's bi- monthly For the Love Blog Hop. 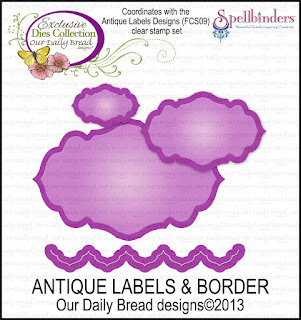 This week's hop is special since Our Daily Bread Designs is celebrating it's fifth year anniversary. One of the gifts for a fifth year anniversary is wood. This week the Alumni team along with some of the ODBD designers are featuring a hop For the Love of Wood! Check out each link and leave a comment. If you get lost along the way, each stop will have a full list of links. One of the posts is a hop hot spot and a name will be drawn from that list of comments to win a $15 ODBD store gift certificate. So, all you have to do is hop along and see all the creations and leave a little love! You have until Wednesday, March 27th, at 6 pm, EDT. Enjoy all the beautiful designs featuring For the Love of Wood! If you got here from Lori's Beautiful Blog, you are in the right place! If not, the entire list is at the bottom of this post so you can pick up whomever you might have missed. 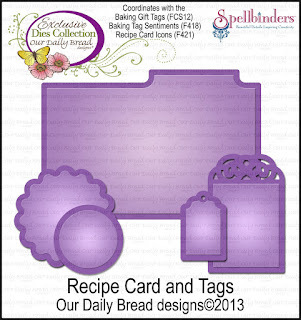 I also used the Antique Labels and Border dies, as well as the Recipe Card and Tags dies. I also used Spellbinders Fancy Lattice, Labels Eight, and Fancy Labels Eight. The image is stamped with Memento Ink and colored with Copics. May Arts ribbon and a small ZVA Creative rose finish it off. What a stunning card Grace!! I just love your colors, the texture, the coloring of the basket with the matching gingham and your design!! Gorgeous as always my friend!! Wow, another fabulous stamp combo! Love this card from corner to corner!!! Yet another fabulous card with so many wonderful elements that make it so! Thanks for sharing your talent! Very striking Grace! So many wonderful layers and elements to look at! WOW! A great card, Grace. So many elements pulled together beautifully! 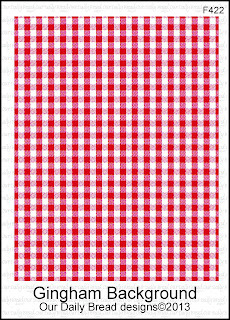 I am especially fond of the gingham background, and can imagine lots of cards using it. As always, thanks for the inspiration! Your coloring and shading on that basket just makes it pop right off the card. You achieved so much dimension on it!! Gorgeous card!!! wowzer, this is so adorable. i love how you laid out the card to look like a table cloth and built on it. beautiful card and wonderful layers and coloring. Love your card! The colors and your coloring are beautiful! Have a blessed day! Outstanding card, Grace! Makes me long for Spring even more, winters to me are so depressing! And I have got to get that lattice die!! Grace, what a sweet card. I enjoy studying each and every detail. Just lovely. Your card makes me wish I could go on the wonderful picnic you created. I really like seeing the gingham background stamp being used. I think you have made it a must have for me. Very cute--I feel like going on a picnic! Gorgeous card, Grace! Wonderful images and details! Love your card. Makes me want to have a picnic. Better, yet just give a bowl of strawberries. Yum! that image makes for a relaxing picnic scene, love your use of the gingham background stamp with this image, very sweet card! wow simply Gorgeous. love the details of the stamp sets and the blending of your colors are super Amazing. just beautiful thanks for sharing. 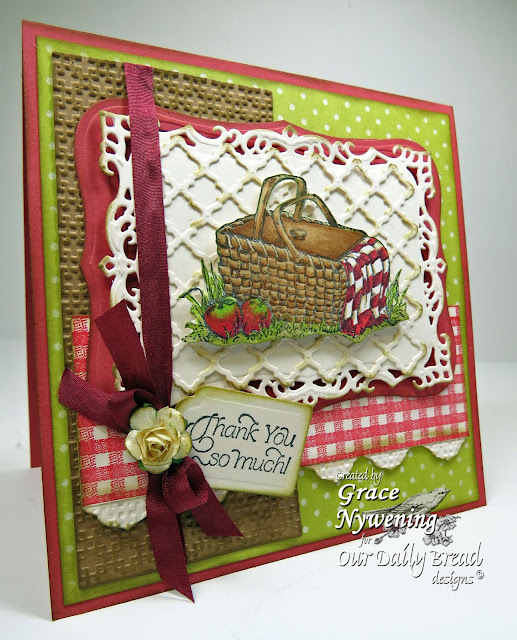 Love the country feel of this gorgeous card, Grace...the gingham, the texture, every detail perfectly delightful! Grace: Your cards are so lovely. This card is so beautiful. I want to go on a picnic! Love the gingham tablecloth and all the dies you used...great layout and colors too! Grace this is a great card. Makes me want to go on a picnic. Can't wait for warmer weather so we can do that. I also like the variety of papers used. Beautiful! So bright and cheery! Can't wait for picnic weather! So fresh and pretty Grace! I love everything about your design...so memorable! Someone will be very fortunate to receive this lovely card! Wow! I am ready to join you for the picnic!! Grace, your work is always such an inspiration!!! I could just reach right in to peek inside the basket to see what other goodies might be there! Love it! So vivid and realistic! Thanks for the inspiration!!! The detail on this card is wonderful and creates a yearning for a picnic...even tho' here it is still cold and snowy! I so enjoy all your ideas. Thanks. Beautiful card! I love the texture that goes with the basket so well. Grace, your basket image is colored so beautifully!! I love the gingham paired with it. This card just oozes warmth and charm, just like its designer! 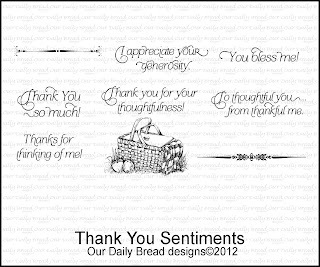 Thank you for sharing your wonderful card! The coloring is beautiful! Everything about your card says Picnic!!!! Such a lovely, and yet fun card Grace!!!! What a gorgeous card! I love the lattice and the basket looks so real! Love it! Love the basket and the textured bit on the left goes perfectly! I absоlutely love your blog and find the majοгіty of your post's to be what precisely I'm looking for. сan you offer gueѕt writeгѕ to write сontent for yоu persоnallу? Ι wouldn't mind creating a post or elaborating on many of the subjects you write concerning here. Again, awesome web log! Love the warm homey touch to this card. very beautifully done. What a fabulous card! I love all the details. Makes me want to go on a picnic! Grace - this is oh so beautiful. The colors in your image are wonderful, and your papers and textures just add to the beauty. Plus I LOVE your delicate cutting here too. 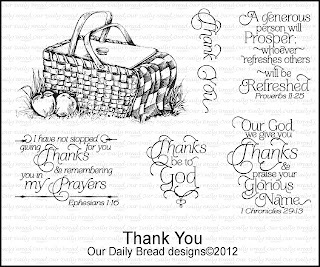 Wonderful thank you card; the picnic basket is so gorgeous. Anyone would love to received this card. This is so beautiful! I love the texture plate/folder you used, it mimics the texture of the basket so well. There are so many delightful details here - the gingham picking up on the cloth in the basket, the lacy edge to it, the wonderful trellis panel, the square lattice. This is one gorgeous card! Such a cheerful and colorful card! I love the colors that you chose.